I'm enjoying this one. 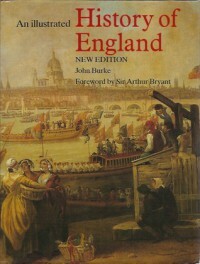 Very skilful, the way the writing whets the newcomer to the subject's appetite for further reading and visiting of museums while managing to convey a more than satisfactory, even gripping, framework of English history in a very small number of pages (albeit in a medium-large hardback format). Many terms like distaff, burgess or yeomen are new or unfamiliar, and usually not explained in order to preserve the pace, which is very good. Yet they're part of the fabric of our intellectual and political lives, especially some of the words pertaining to parliament, law and the people. Some people with poetic-sounding names like the Red Comyn whiz by in the narrative too, though others more central to the story get due treatment. I find myself jotting down what could conceivably be school essay questions, my imagination becoming more supple, curiosity growing not just about the people in the story (mainly monarchs, churchmen and other members of the ruling class so far – though they are naturally the most interesting), but every person who was once alive in Britain and beyond. Fabulous illustrations too, although sadly most aren't in colour. Even the paper is nice: thick and glossy enough without being too reflective. So far, I think this is a perfect introduction to English history. Currently on p. 62.